The Research Handbook on the Law of Treaties provides an authoritative treatment of fundamental issues in international treaty law. Identifying key challenges facing the modern law of treaties, the Handbook addresses the current regime and comments on potential directions of the law. Rather than an article-by-article commentary on provisions applicable to treaties, the Handbook offers an innovative study of their spatial, personal and temporal dimensions and of the tensions that arise due to the need for both flexibility and certainty in treaty relations. 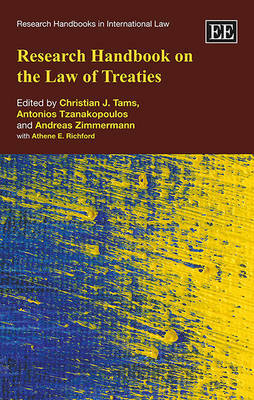 It analyses the interaction between treaty regimes and potential ruptures, as well as the expansion of treaty law to international organisations, corporations and individuals. Each chapter includes an `agenda for research', highlighting areas where future work could yield significant results. This pioneering Handbook will prove an invaluable resource for researchers and advanced students, as well as providing unique insights for practitioners of international law.